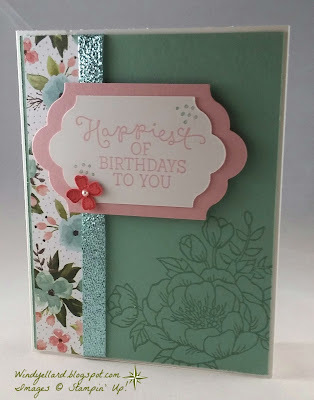 I love the softness of this card! I tend to hoard it! 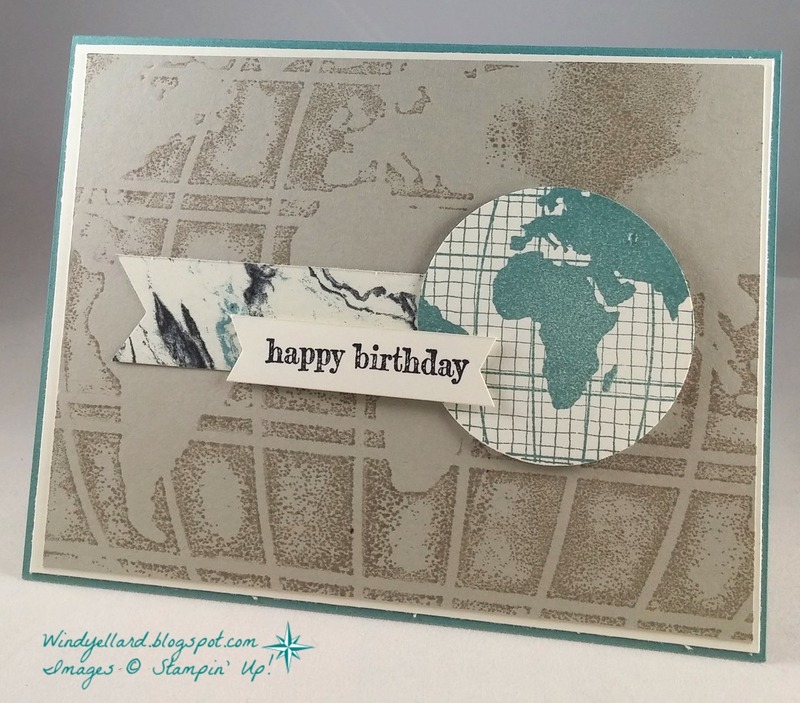 Love the layout and texture here, too. I forget about this emboss folder but it works well with many themes, etc! by my friend Dawn Tidd! GDP029 For My Awesome Friend Lisa! and then the colors only made me think of fall! and one of my awesome uplines, Lisa Pretto! so I knew I would make her a card with balloons! All of a sudden I had this card and the pop of color stands out well! PP288 A Star Happy Birthday! I looked at my straps of DSP on my desk and went from there! and then mounted on a star die cut. Fun! Second card for April's card classes next week! looked stiff in catalog but it is soft! Happy Easter and Enjoy The Little Things! 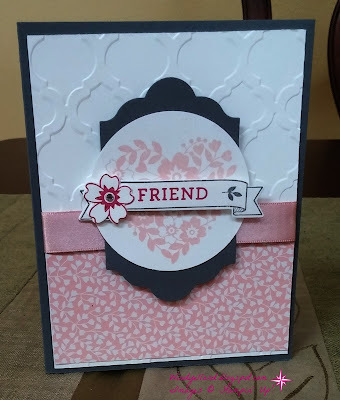 This is my first card for April card classes coming next week! in White on Basic Black. Finished off with some Melon Mambo/ Basic Black twine. Just thought how we have not done any heat embossing the last few months! It needs to be done regularly...love it! 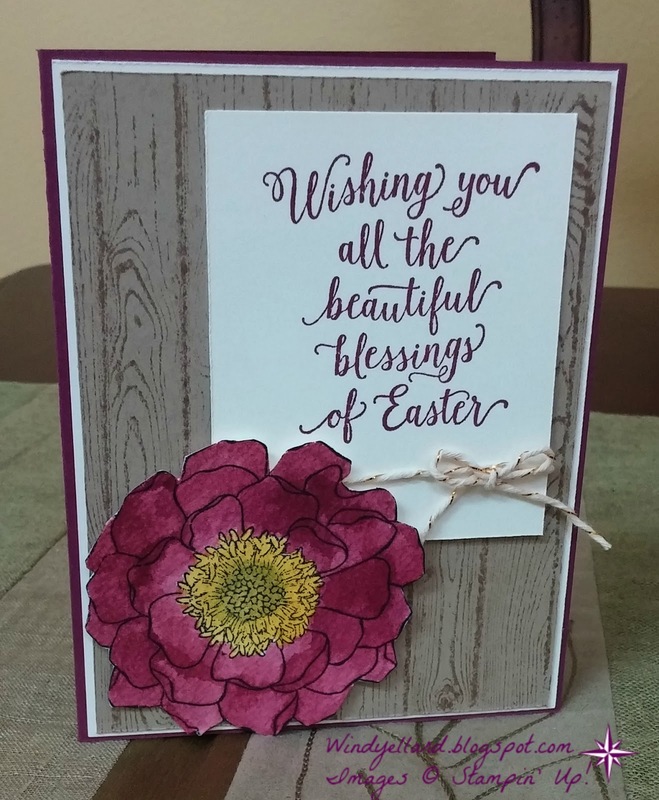 I hope your Easter is full of blessing and thanks for stopping by! 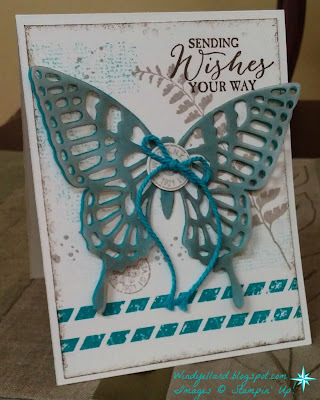 Last of my Butterfly Basics week! Still love to use the elements in this set as background! 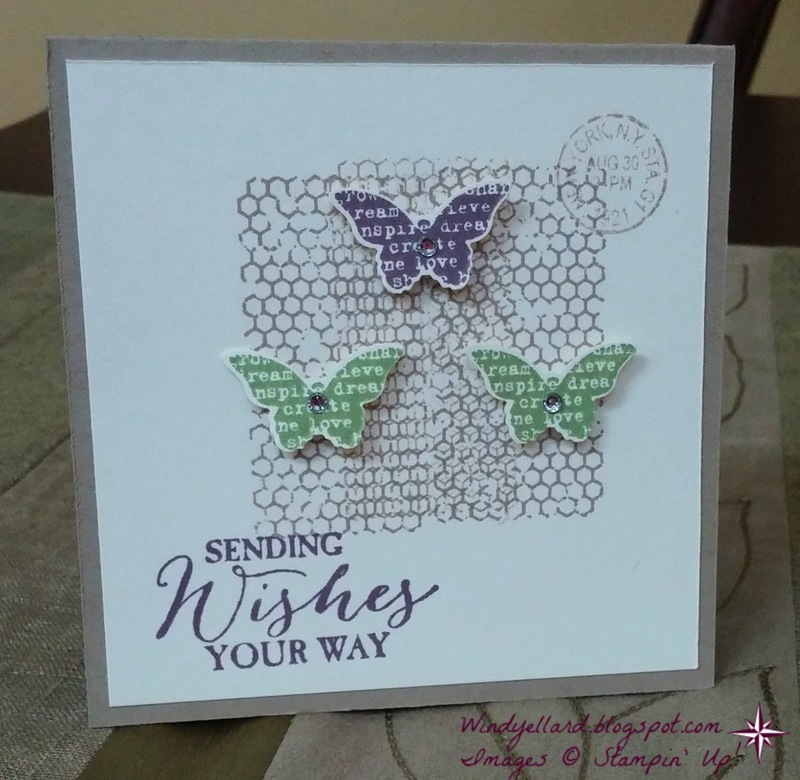 I did change the set of butterflies here to Papillon Potpourri stamp set. 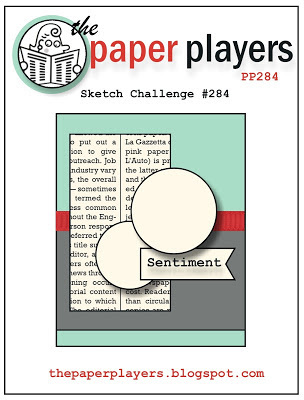 please stock up on your inks, refills, card stock, etc this month! 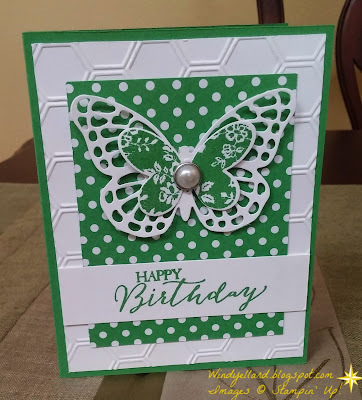 Fourth card in my Butterfly Basics card week! Check out my blog starting Monday (March 21st thru today). 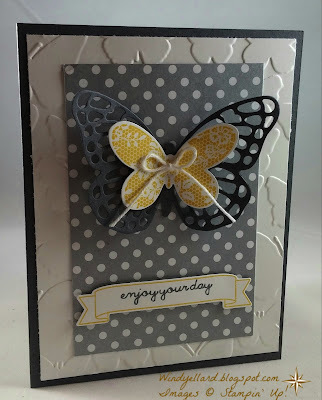 and layered my butterflies. I love the white and green together...looks so fresh! I wanted some texture added so grabbed my honeycomb emboss folder again! Been hoarding the rim pearls...need to use them! Well, now I have only one sheet left of So Saffron card stock! I like the color ok but never grab it as a yellow. I like other yellows better. I think I only use it in a color combo challenge. and so grabbed it again for this challenge. 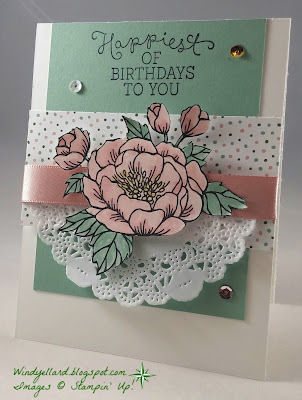 Added a little bling with some Blushing Bride glimmer paper. I fussy cut the flower and popped it up! 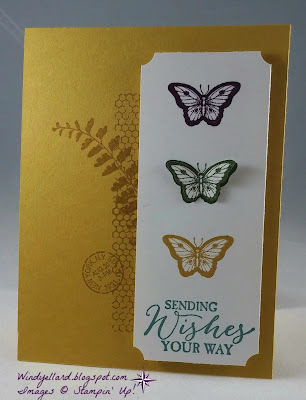 Well, why not another Butterfly Basics card. 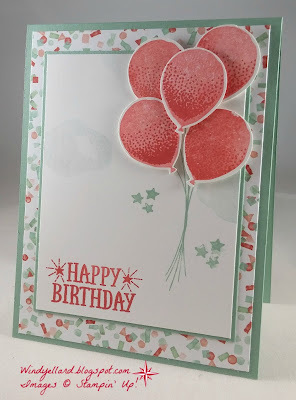 Third card in my series of this awesome stamp set! This one measures 4" sq. plus punched out a few bitty butterflies all from the same set! The color combo of Perfect Plum, Wild Wasabi and Crumb Cake is great, too! 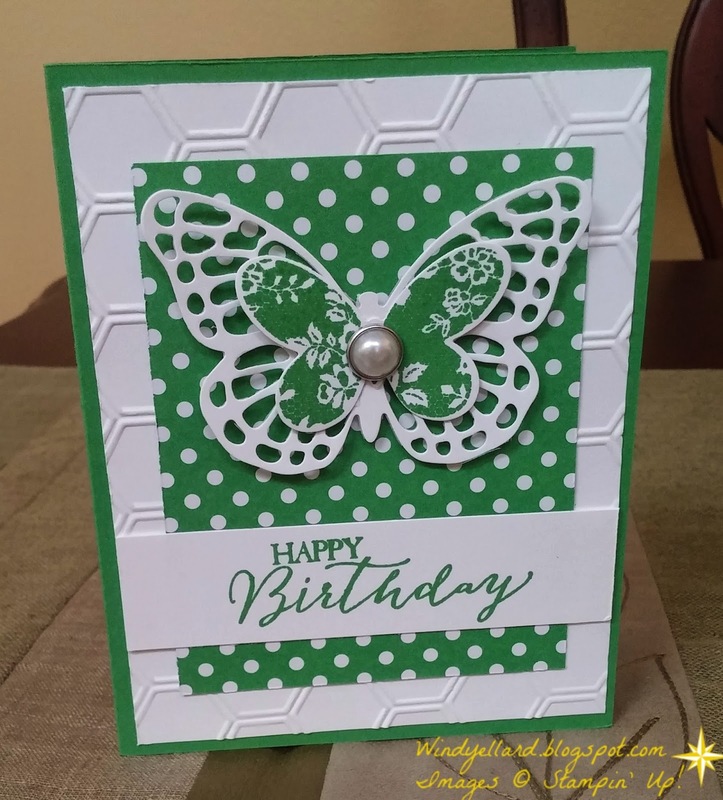 I love this big butterfly die (as well as my large butterfly stamp called Swallowtail). I love something like this above where I can "grunge" and make my own background! ink on the vellum butterfly. Love the effect! 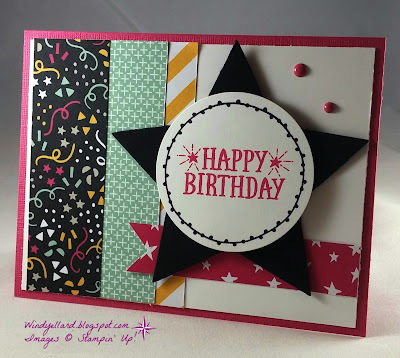 I hope you get some time to play around and stamp/craft today! 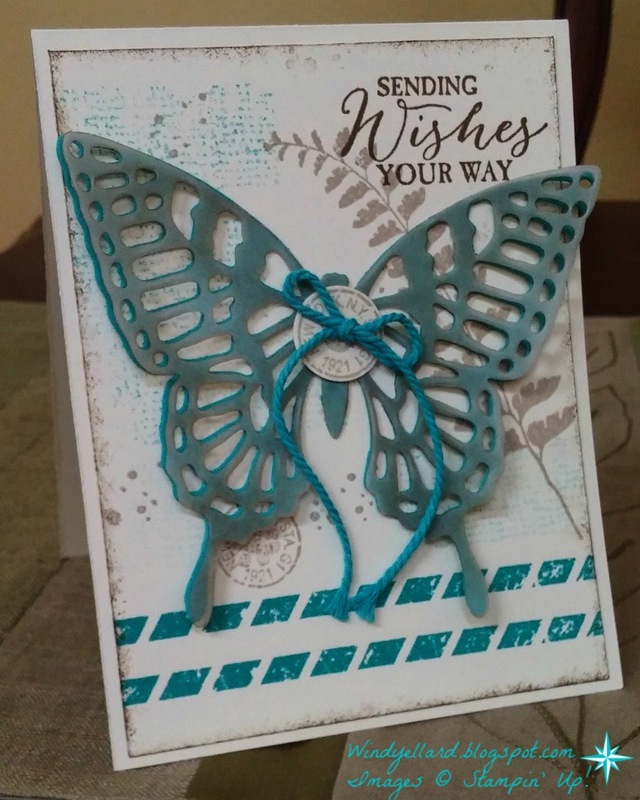 First Butterfly Basics card for the week...5 days of one set! Promise you will see how versatile this set is this week! 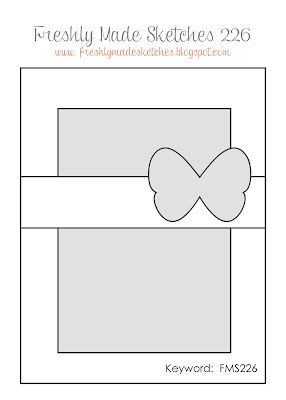 and color the sweet flower from Butterfly Basics. Colors pulled from the English Garden DSP makes it easy. I hope you enjoy your Monday...I will---spring break here! I did some water color wash over the water color paper with Mint Macaron ink. Garden Green, Cucumber Crush and Rose Red. 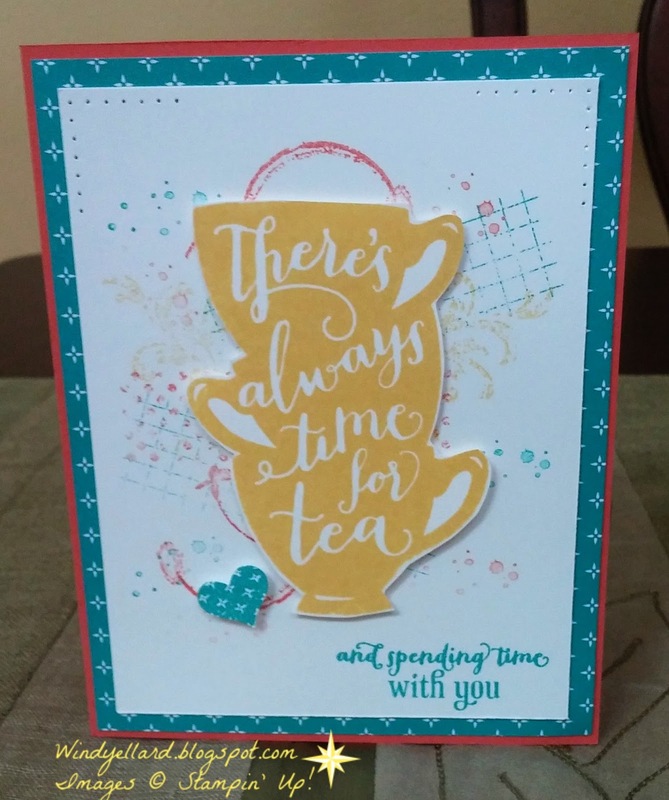 and a lovely card ready to send for several occasions. I hope you can stamp/craft this week. I will be doing some fun things as it is spring break here! Have a lovely Palm Sunday! This could look like an awesome lollipop but it is in fact a fun balloon! And with a little bling, too! I did like the heat emboss with gold on the vellum...great banner! I designed this card for the Phoenix display back in Feb. I used the Timeless Textures set to create a cool background! I used some bright colors together for a fun look! First, Happy St. Patrick's Day to You! I broke down and got this set! 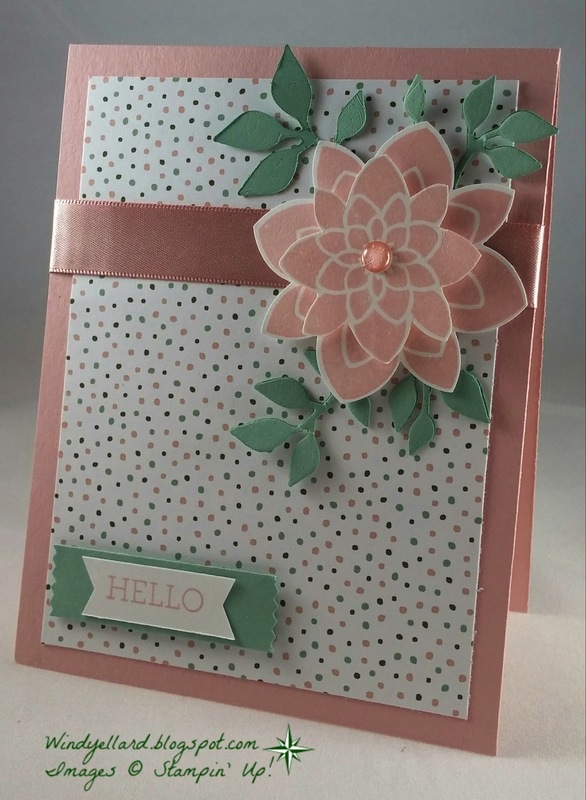 I did not need any more flowers but I love the cards/projects I saw with this set! not cut out the entire image. Left off some stems like leaves! and decided to layer over some great DSP. 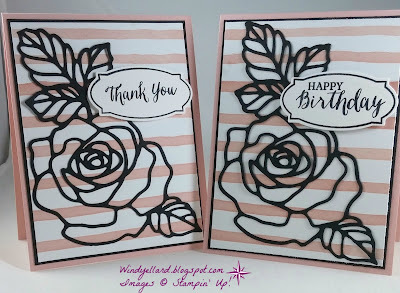 I think they look striking on the Blushing Bride stripes from Birthday Bouquet DSP. 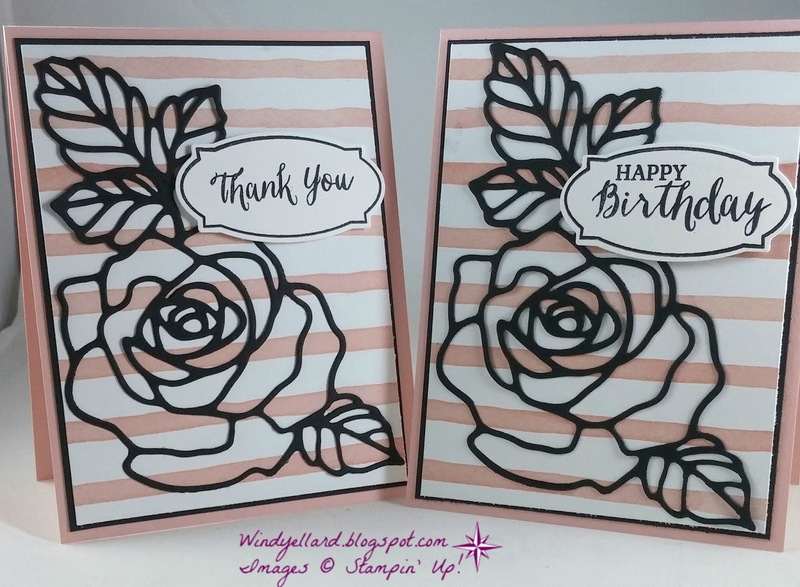 Makes for a quick birthday or thank you card! I hope your day is awesome and thanks for stopping by! 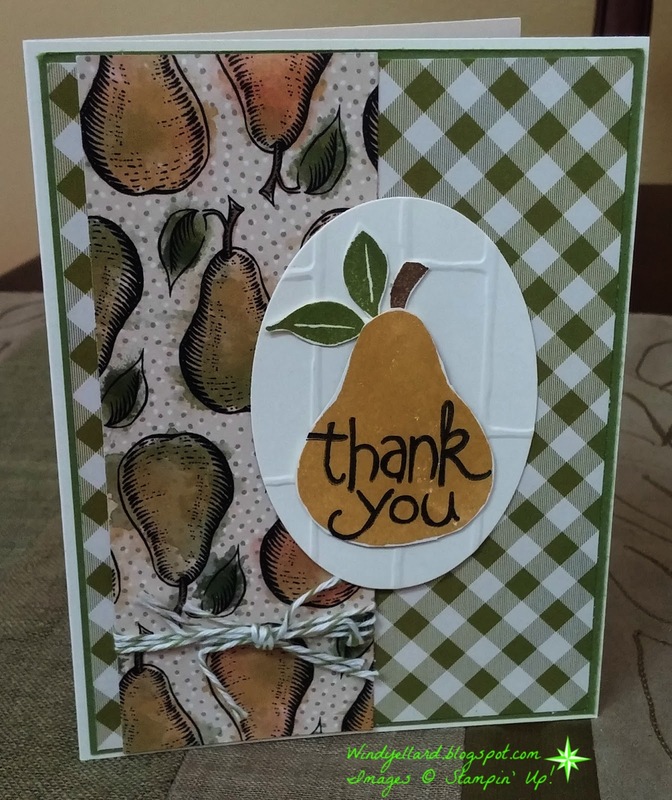 GDP027 A Pear Thank You! 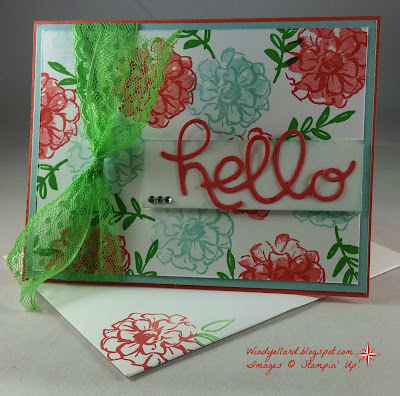 I love the Farmers Market DSP...I hoarded it and wish I had used it more. Here I "peared" it with the Apple OF My Eye stamp set for a cute and quick Thank You! A little Brick Wall embossing gives it some more texture! 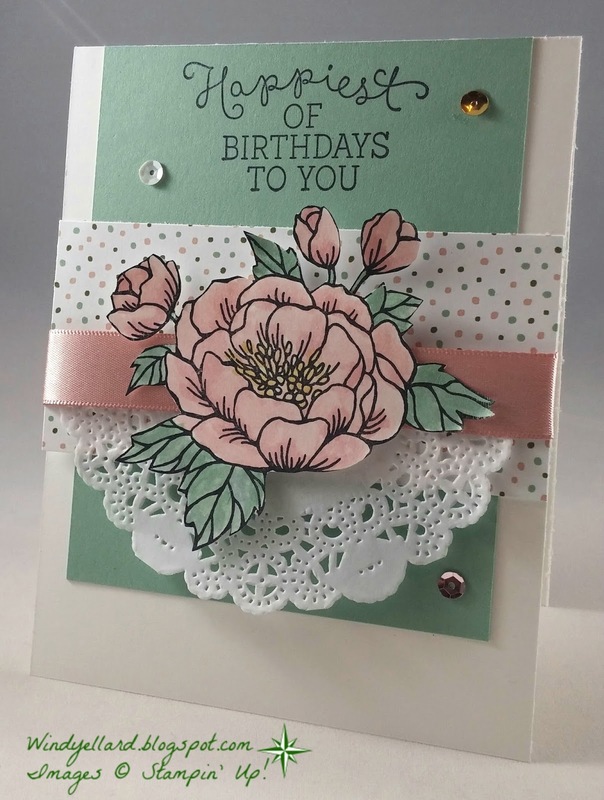 and decided to change the sentiment and flowers on the design. and then the Itty Bitty Accents punch flower layered on top. 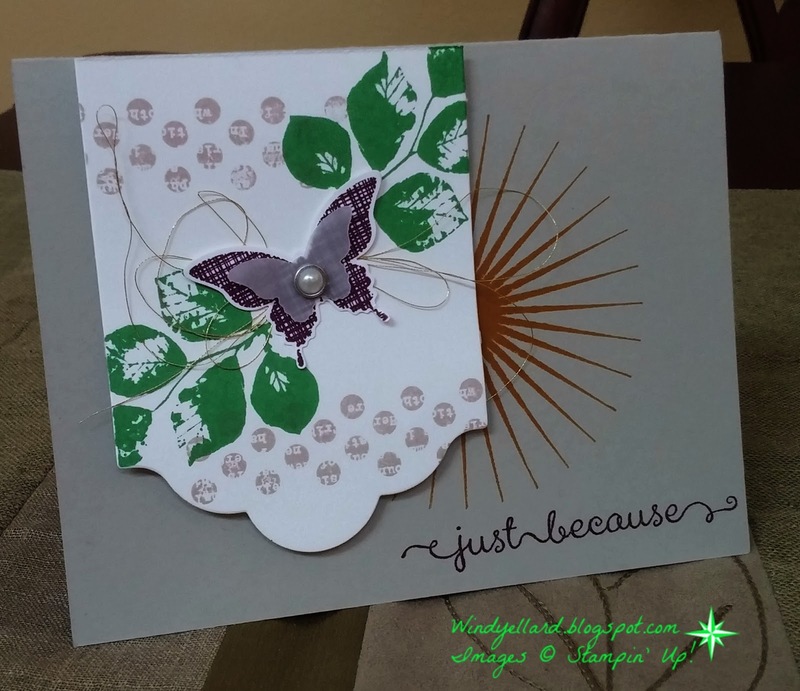 The leaves are from a vintage die. Still love this sentiment and font! I cased the layout and love the label frame used like this! I also still love this set but do not use it as much as I should. I hope you have a sweet Sunday and thanks for stopping by! I Do Love Purple! 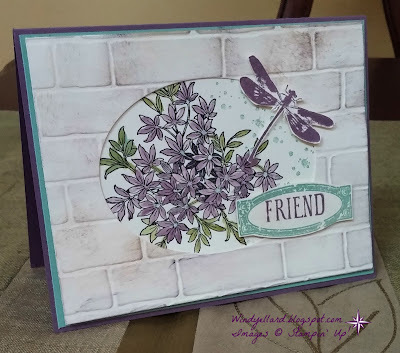 I started with the idea of the "window"
and using the brick folder distressed with sponging. But wanted to use something I have not used much inside. 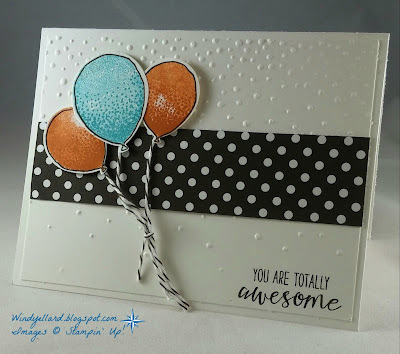 Love this card...need to try this in some other colors! I designed this card for a display in Feb.
At time, I was trying to figure out how to use the sentiment and something else.
. 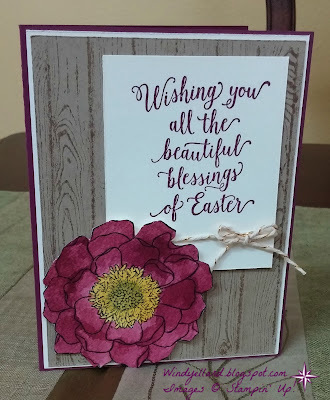 I am not great at the coloring here but I really like the way the card turned out! I hope you have a blessed Friday and thanks for stopping by! Happy 18th Birthday to my son, my baby, Cole! I can't believe I have two adult children...where did the time go? by my fearless leader, Mary Fish! but then sat awhile trying to come up with a layout. 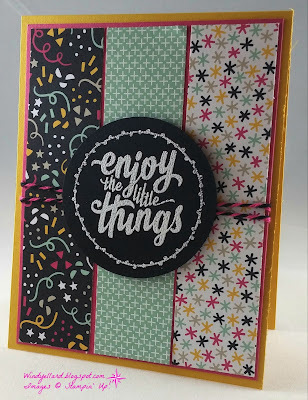 Colors come easy to me but not the layouts! I wanted to use his set before it is no longer around...SAB ends when March does! 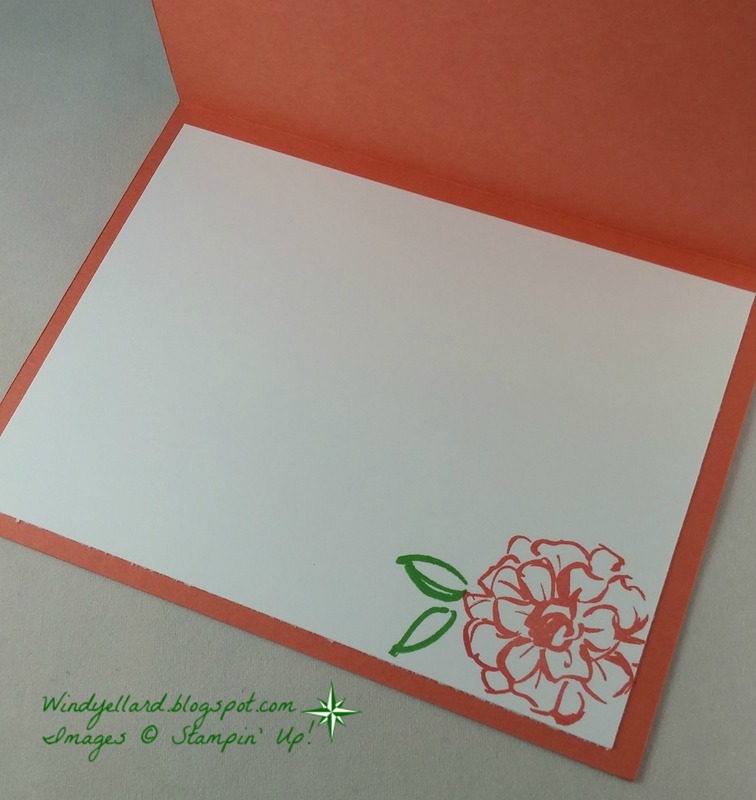 I added to the outside of the envelope and the inside of the card. The colors are bright but Pool Party calms them a little bit. I sponged some around the white under the Hello to make it softer. Happy 18th Birthday to Cole! Tomorrow my baby will be 18th and I will have two adult children! 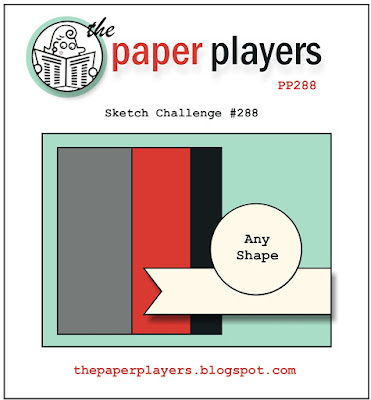 my PPA color challenge card tomorrow! they will carry to the new catalog along with the matching dies! 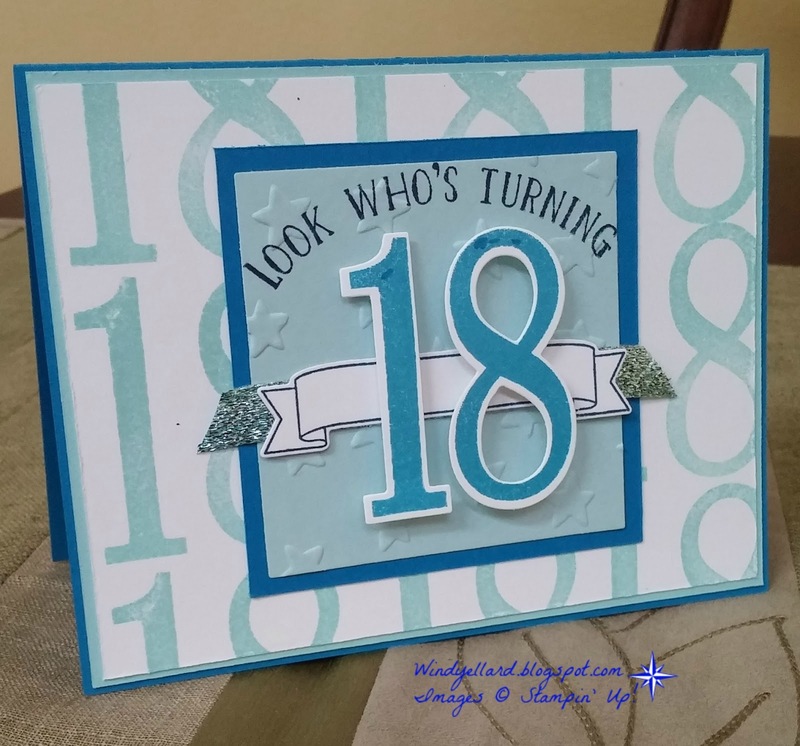 I used a mix of blues (Cole's fav color) and I think he will be thrilled with his card! Another take on my card from class last week. 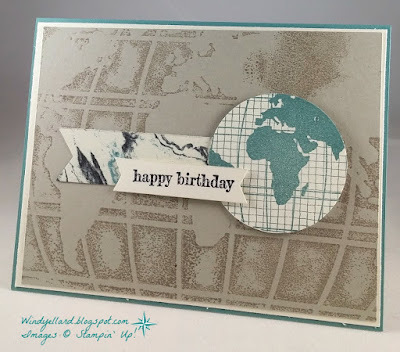 This time I used the World Traveler emboss folder as a stamp! and closed it and then rubbed it to make the impression. Have a world of fun today! A lot of balloons is how you do it! Another take on my card from last week's class. 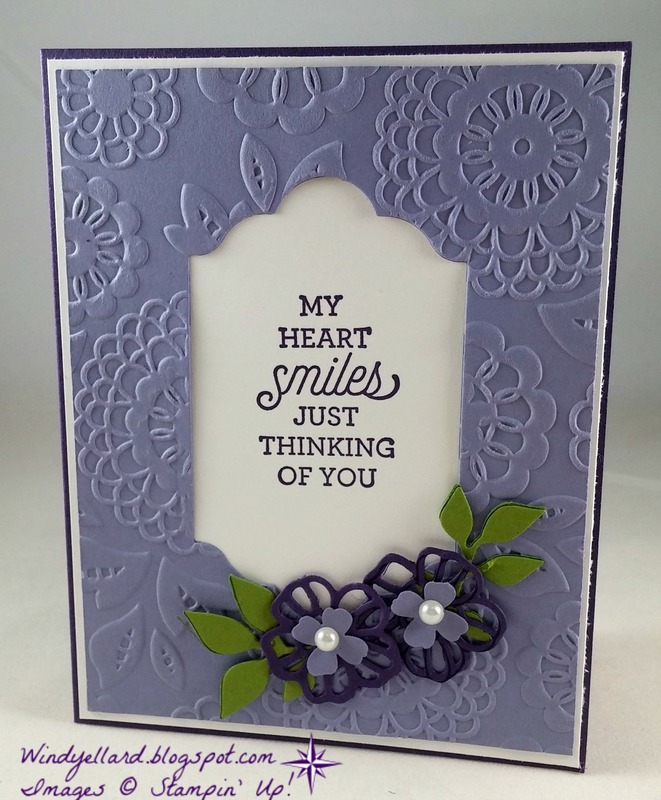 I love the sentiment here from You're So Lovely! So glad I got this set! Well, both of these sets! and decided to cut my circles of fruit to make "slices". I love these sentiments and font from Lovely Amazing You! I had an extra Blushing bride base cut and started there. I have been hoarding but need to use! I stamped the flower twice in Blushing Bride and cut one smaller to layer. Not so good at fussy cutting! 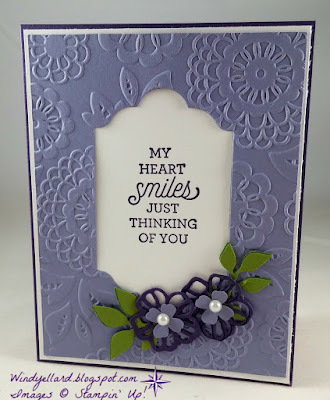 also from the same set as my flower-Crazy About You! 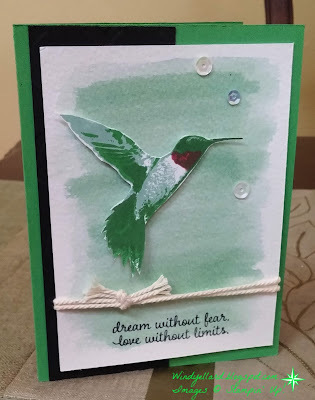 Very quick but adorable card in minutes! I hope you have a fab weekend...my baby girl arrives today for spring break! 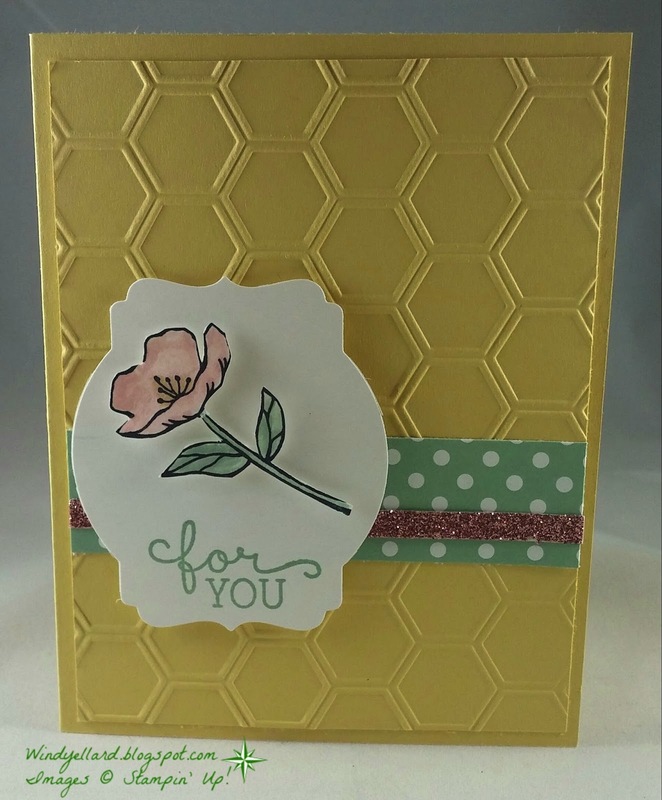 and love the pop of yellow! 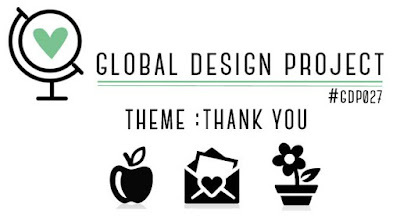 I used the banner and the sentiment from You're So lovely. for spring break and have some beach time! 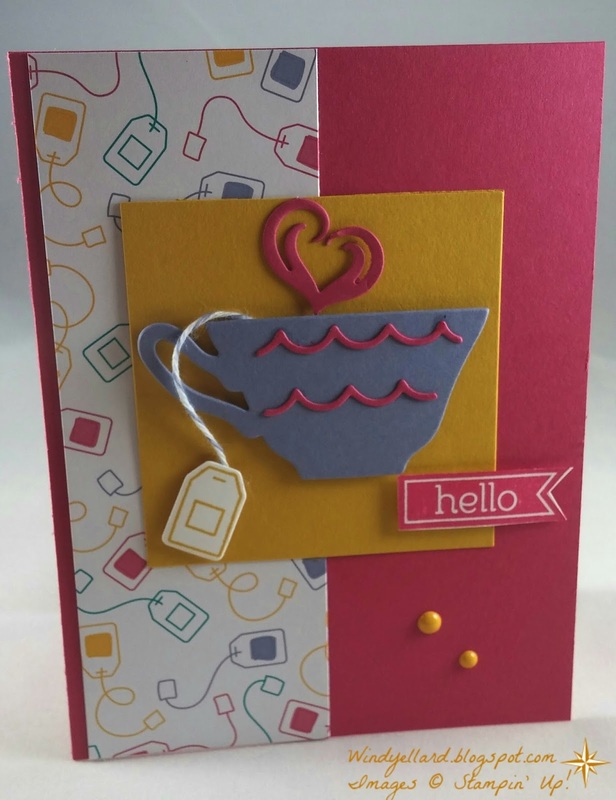 PPA 290 A Nice Cuppa Hello! 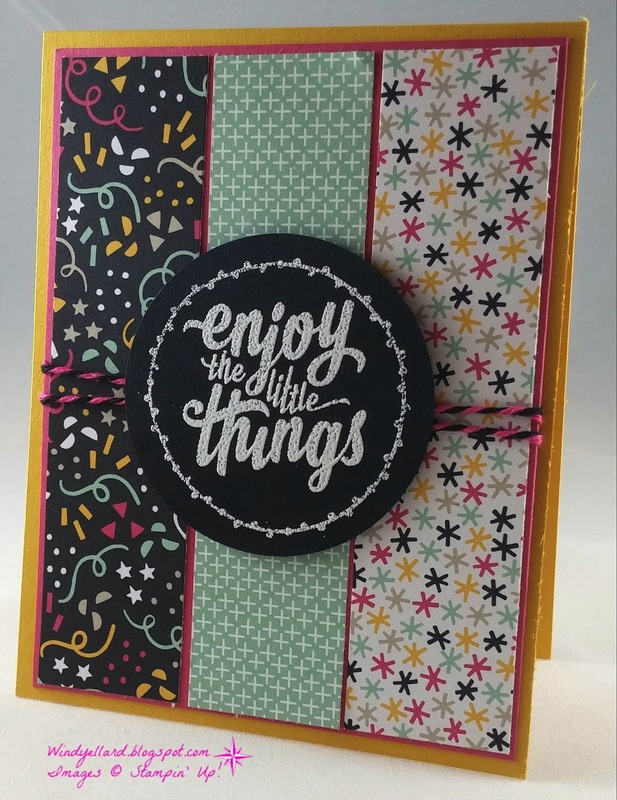 and then went from there with colors and stamp set, etc. 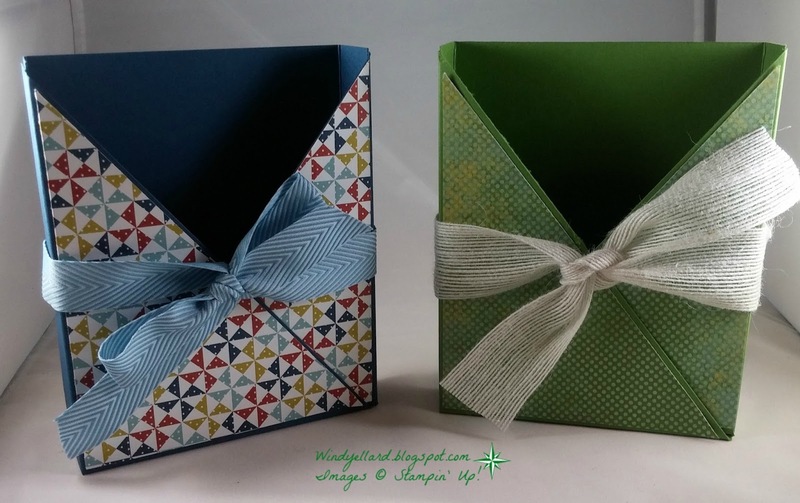 and the matching stamp set and dies make it quick and easy. 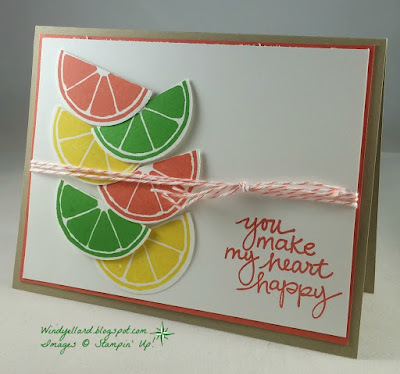 It is bright card but fun and I hope you can play along this week! And have fun with this sketch! 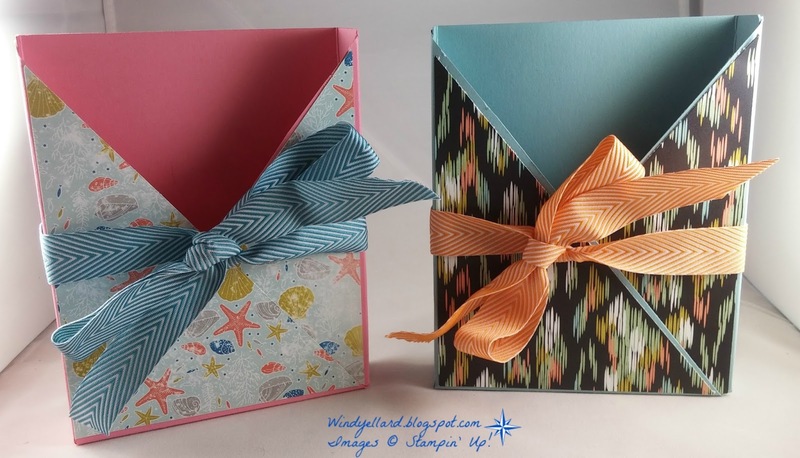 this week to carry home their creations-cards! 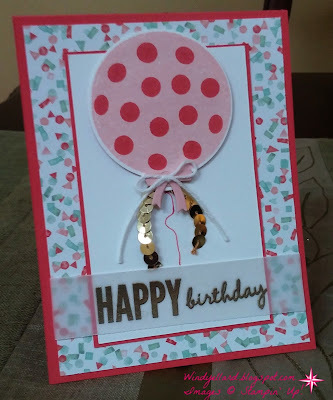 I used retired DSP and ribbon along with retired card stock. 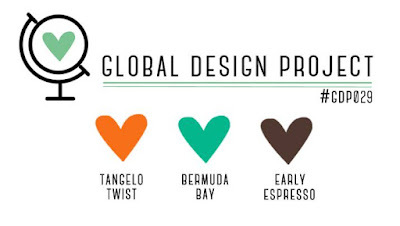 These are just a few of the colors I made. 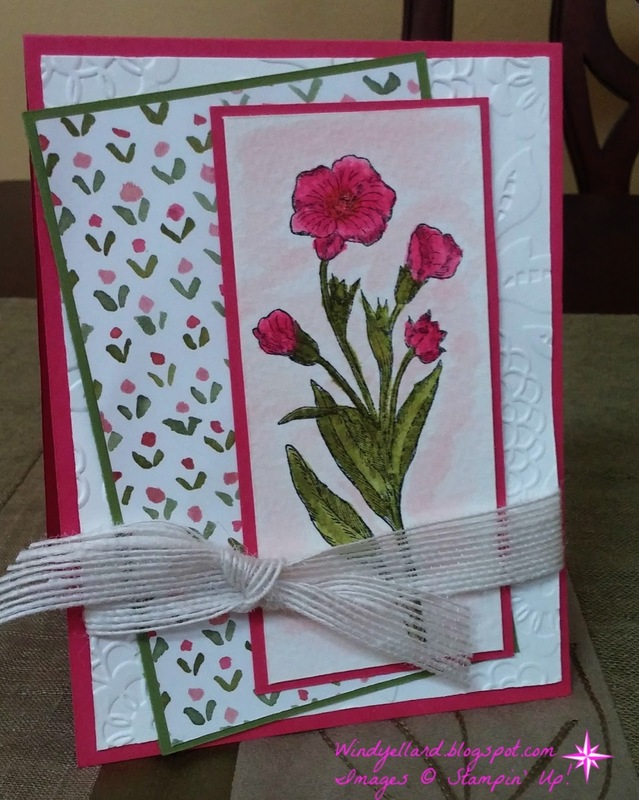 PP284 Thinking Of You Spring! and saw some beautiful spring color combos. on my own for this great sketch challenge. 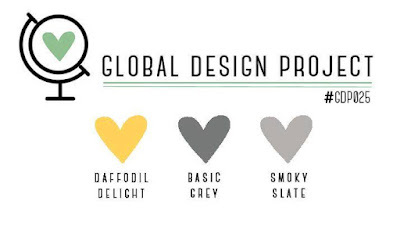 I picked up Smoky Slate, Pink Pirouette and Soft Sky but then what to do with them? so I reached for my Flower Shop stamps and matching punch! 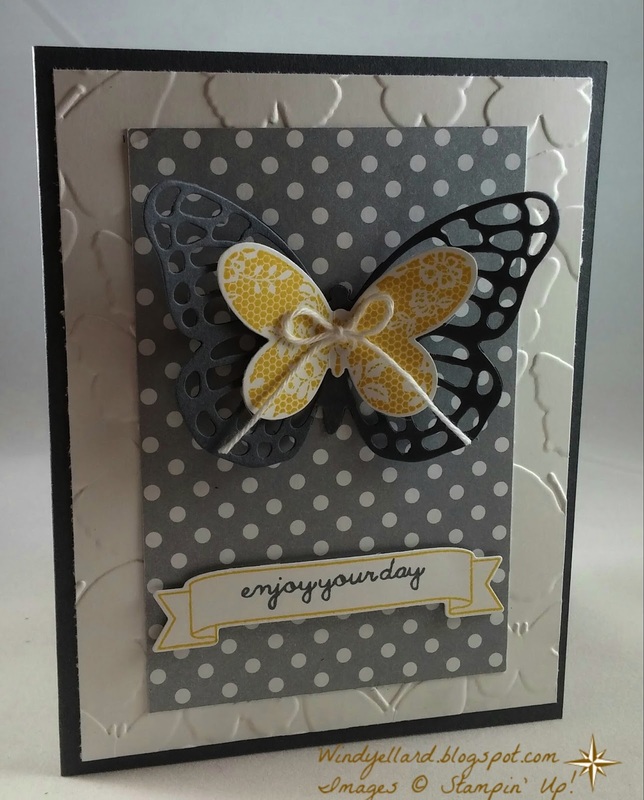 with the script design from the Neutrals DSP in Smoky Slate. 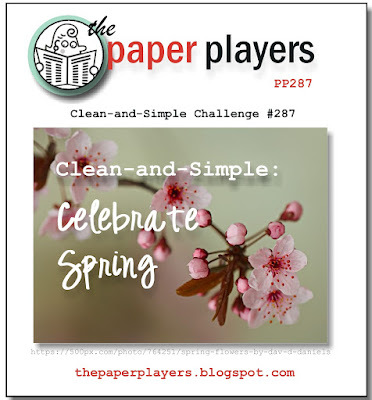 Join the challenge over at thepaperplayers.blogspot.com!